What? Are you serious? Can this be true? Who is speaking? Not Jesus! At least, not Jesus we know. Our Western culture, especially lately, is used to portray Jesus as a very nice guy, everyone’s friend, our buddy, whose message can be summarized as “let us be nice and friendly people and then we’ll all go to heaven”. This image of Jesus has become so widespread. We picture Him this way. We teach about Him is this way in churches and schools. We sing songs about Him in this way. Our culture has built this image of ‘sweet Jesus’. This is no wonder that people turn their backs to this ‘buddy Jesus’, when they have mastered this message about being nice people and going to heaven and have found better friends or better things to do. We have forgotten who Jesus is. We have forgotten what is this peace that He is bringing, and we have forgotten what it costs to have this peace. Today we’ll try to remind ourselves, what is this Jesus, what is this peace and what it costs. Today we often encounter this ‘sweet Jesus’ image. But the Bible reveals us totally different Jesus. True Jesus, the Son of God. The Lord of all things. The one who is coming to bring fire upon this world. These verses from today’s Gospel are like a wake-up call. We can read in the New Testament quite vividly, what kind of person Jesus Christ was. Think about the cleansing of the Temple in Passover, described in John 2. This was the largest annual festival for Jews. Tens of thousands of pilgrims came to Jerusalem every year. Most of them wanted to bring a sacrifice, therefore this was a huge and profitable religious business to provide for them oxen, sheep or pigeons. That was a huge business to change money to be able to make all these purchases. So many were on it; sellers, money changers, all these animals and birds. Marvelous religious super market! Then Jesus made a whip of cords and drove them all [!] out of the Temple. Alone! Everybody, even Jewish leaders realized that “no one can do these signs … unless God is with him.” (John 3:2) Try to picture ‘sweet and friendly Jesus’ doing this cleansing. He was not speaking somewhere in dark corner, whispering it to His disciples. No, He was speaking to the scribes and the Pharisees on a street. He was after them. They try to disappear, to hide, but He was there “Woe to you, you hypocrites!” No wonder they plotted against Him. Or think about that evening, when Jesus was betrayed as described in John 18. When He was in the garden with His disciples, Judas, the traitor, came and lead a mob of people. John mentions interesting fact, which otherwise could slip away. Judas came with a cohort of soldiers. The size of cohort could vary from 150 to 600 soldiers. So they came. With them also servants of the Pharisees and the chief priests with torches and weapons. Why did they come with so many people to arrest this ‘sweet Jesus’? Seeing them Jesus said: “I am He, whom you are seeking” and then, unbelievable! seeing Him, they drew back and fell to the ground. (John 18:6) A cohort of well-trained Romans and other men with weapon as well… they drew back and fell to the ground before Him. Scared, frightened, unable to stand before Him. Think about the rebuking of the storm, or subduing all the demons, or the raising of the dead. When people saw all these miracles they were frightened to death. Who is this man? What is this power? We need to look at the Old Testament as well. God used to appeared to His people, and quite a few of these encounters are described in the Old Testament. Remember one thing, whenever there is theophany, that is, an appearing of God, this was always an appearing of the Son of God. Almost every time when a revelation of Holy God is depicted, the imagery of fire is there. Leading Israel our of Egypt. At Sinai. In the tabernacle. Revealing Himself to the prophets. So many times in the Bible we can read that whenever the Lord appears, those who see Him, fall down without strength. This is Biblical Jesus. This is our God. Not some kind of quiet and polite lad, who is afraid to offend anyone. Jesus is the same God Yahweh of the Old Testament, the same God as a consuming fire. The same one, who has promised to return to judge the living and the dead, as we every week confess with the words of the creed. It is good to remind ourselves, that our Savior is not one of sissy moral teachers, who tell us to be nice people… and everything will be fine. No, He is holy, He is almighty, He is like a consuming fire that purifies entire creation from every evil. Now, let’s talk a little bit about this peace, which Jesus is bringing. And why does He seemingly speak again Himself saying that He hasn’t come to bring peace, but divisions. This does sound strange to us. But it sounded almost incomprehensible for Jesus listeners. They lived in a society where family was everything. The most important thing. Today we are used to think about ourselves as individuals, but for Jesus listeners the family and community was far, far more important than individual interests. Suddenly Jesus says that He will be the cause of division even within family. What? That was the order established by God Himself; where children are supposed to honor their parent, and parents as God’s representatives to take care of their children. And now, there will be divisions! Is Jesus bringing them? This is about the ultimate allegiance of our hearts. Whom do we love with all our hearts, with all our minds, with all our souls and with all our strengths? From whom do we expect to receive peace? There are only two ways we can try to have this peace. One is trying to do everything our way, and another – to receive it from God through Jesus Christ. Since that time this has been our way to find this peace on our own. How do we do it? Because we are rebellious against God in our very hearts, we want to have everything our way. We want to decide what we need, what is good for us, what will give us peace and joy, and then we try to achieve it. And we want others to accept our wrong choices, and to commend us for them. Just a few examples. We want to ignore Triune God as if He doesn’t exist, we don’t want to have Him as our God, but be like gods ourselves. If we want to have anything to do with God at all, we want to design Him according to our image. Like ‘sweet Jesus’. We want to tell Him what to do. We want to ignore His invitations to come and receive His blessings, and to learn the truth from His words. We want to make up our minds about this world and us ourselves. Because we are so smart. We want to do what we desire, even against the will of parents, and sometimes against the laws of our country. We want to kill our babies and call it our choice. We want to justify our greed and financial destruction of others and call it free economy. We want to destroy families and lives of children, to poison entire society by our insatiable desire for new and new sexual experiences… and call it our freedom and rights. We want to use other people around us as means to our happiness, and then through them away when we don’t want them anymore. We want to believe that everything is this world is about me and for me. And we want everyone to accept our way to peace. We want to use even Jesus to support our whims. We want people smile when we do this, and we want to silence them when they try to tell us the truth. Then we call it “hate-speech” and bigotry and fundamentalism, and so on. This is our sinful way to peace. Then comes Jesus. And this peace is over. He comes to bring peace His way. “My peace I give to you. Not as the world gives do I give to you.” (John 14:27) He reveals us the truth about us, that we are sinners condemned to death, and about God, who is holy and almighty. He comes to restore us in relations with the Father and with each other. He comes to restore us in shalom, true peace that comes from true God. We are created for relations with our God the Father and with one another. This is our purpose, this is the deepest meaning of our lives. We are created to love our God with all our heart, and to love our neighbor as ourselves. This is our source of peace. There is no other. Unless we embrace it, we won’t have peace. When Jesus comes, He destroys our hopes to have peace our way. He reminds us who we are, that is, creatures. Yes, created in the image of God, yes, precious in God’s eyes, but still creatures. We are not gods. We cannot have peace our way, there is only one way that gets us there. We cannot determine the purpose and the meaning of our lives, and we cannot demand others to accept our whims. Not God! Our Creator determines why we are here, what He expects from us, and what kind of life will give us true peace. Going against the God’s design for our lives won’t give us peace. No, it puts us in war with God. As rebels. Ungrateful, foolish rebels. If only we could stop claiming and acting like we are gods, we could have true peace again. We could have peace and good conscience in relation with God. Then we could embrace our neighbors and love them, serve them from all our heart. We could, but we can’t. It is not that simple. Do you think it is easy? Go and try! Try to love holy and almighty God who reveals and condemns all your sins, demands unconditional obedience and threatens to throw us into eternal fire. How can we do it? Let us be honest… we can’t. Here we come to the last point that we need to remind ourselves; what is the price of this peace that Jesus brings us, what does it cost? 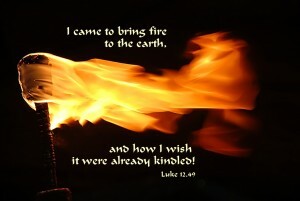 Jesus had come to bring fire and he wished that is were already kindled? What is He talking about? Is He so impatient to judge all the evil ones. To bring His just and well deserved punishment upon us? No, not at all. He has come to show His love, to receive our punishment. He steps into our place. We are rebels, we sin against God, we disobey Him, we corrupt His world and wound those around us. We are so ungrateful and we deserve to experience the wrath of holy God, His unbearable purifying presence. But Jesus, the Son of God, steps into our place. In your place and in mine. Why? Because He loves you. Do you think it was easy for Him? “I have a baptism to undergo, and how distressed I am until it is completed!” A baptism is nothing by a purification, a cleansing. What kind of purification He is talking about? He is talking about taking away the sin of the world, your sin, yes, all your sins, about being beaten, mocked, tortured, spitted upon, ridiculed and crucified… in your stead, by those whom He came to save. No wonder that Jesus was distressed. He became a man to receive the wrath of God that we deserved. And to give us all that was His; His holiness, His righteousness, His life, His kingdom and His Father. How would it be to live clearly knowing what is your destiny? The most painful death. From the hands of those whom you love. Giving up everything for those, who hate you. So that only they can have peace with God. That was the price for the peace that Jesus is bringing. The blood of Jesus Christ, the Son of God. He loves us first. He brings His peace to us today, right here. The same holy blood that He shed for us of the cross, He gives to us here. He gives you His peace. Come as a child of God, come as a forgiven sinner! Come and receive!